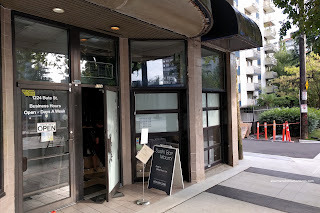 There once was a new sushi bar called Maumi located on Bute near Davie. When it first opened, the menu consisted of the usual items including sashimi, nigiri and rolls as well as some cooked items. One could even get the stuff to go. There were also a few small tables including a sushi bar. Then, things changed. Away with the rolls and sashimi, then the tables and heck, no take out. How about just 10 seats at a sushi bar and other than a few appies, only an Omakase menu consisting of either 10 or 12 pieces of nigiri? Well, that is what Sushi Bar Maumi is about. Fresh fish flown in 5 times a week from Tsukiji Market and prepared by sushi master Maumi Ozaki (with 20 years experience from Japan). Viv and I decided to check the place out by doing a few things, such as making a reservation and arriving on time. If you do neither, don't plan on eating there. Second, I made sure to only take pictures of the food, pictures of anything else is strictly not allowed. Onto the food shall we? 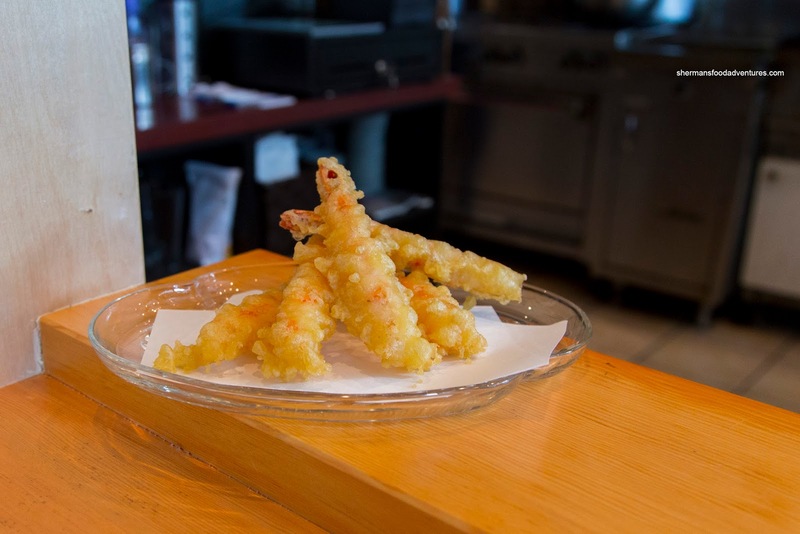 Starting off with some cooked items, we tried the Black Tiger Tempura. This was a well-executed dish with fresh prawns that were meaty and buttery. The batter was medium-thick, yet cooked all-the-way-through and lightly crispy (while not oily). 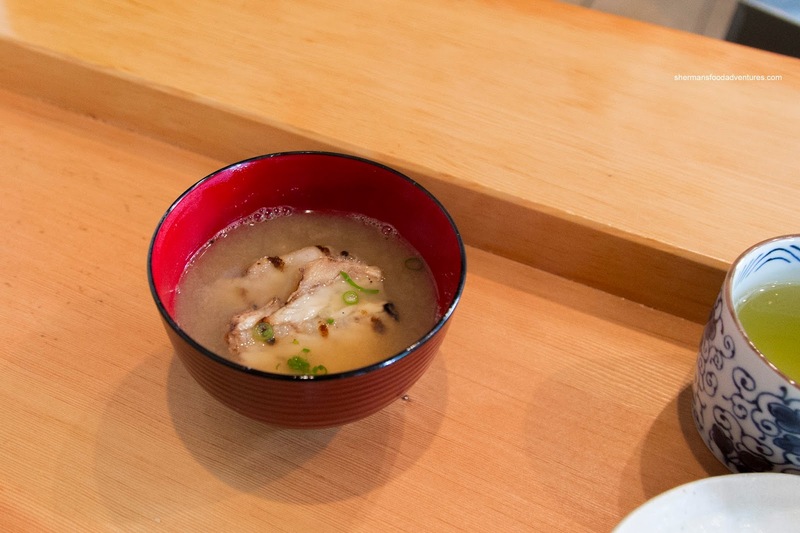 We also had 2 bowls of their Ara Miso Soup which was nicely balanced. There was a good fishiness to the broth that was sweet and slightly briny. The miso itself was only in the background which was fine by us. 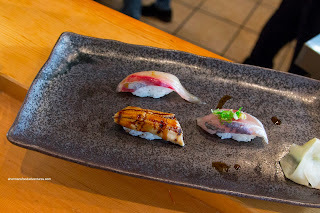 Moving onto the main event, I decided on the Omakase Nigiri Premium for $60.00 while Viv had the $40.00 Omakase. 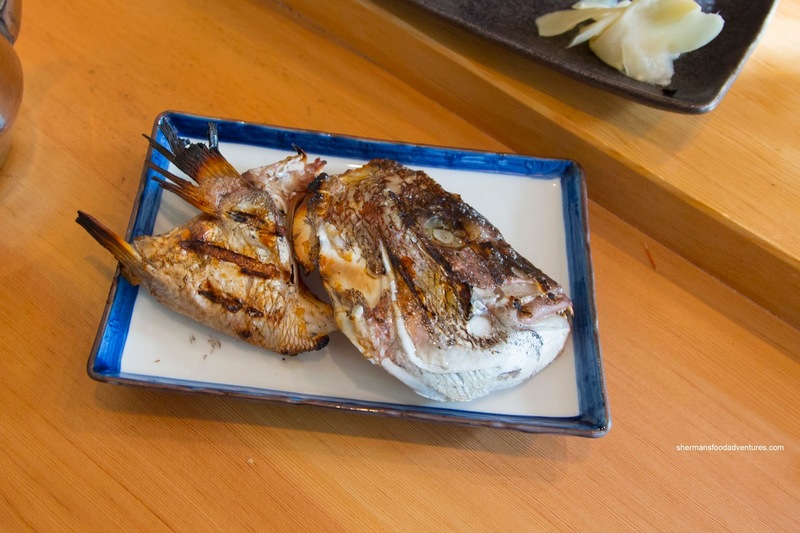 We were started off with the Black Sea Bream where we could taste the natural flavours with a slight chew. The light brush of sauce provided a rich background sweetness that didn't interfere with the clean flavours of the fish. Buttery and sweet while not mushy, the Spot Prawn was on point. Normally, I'm not a huge fan of squid sashimi, but the Flying Squid was actually quite good. It was firm and sweet with not much in the way of sliminess. 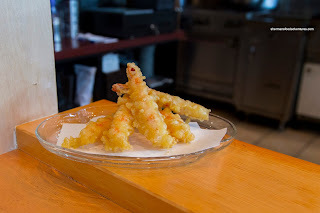 Another treat was the Hotate from Hokkaido as it was buttery and intensely sweet (compared to the fish). I liked the texture as there was a slight rebound rather than being plain soft. The gift that kept on giving (well, a gift we paid handsomely for...) continued with the Shimaji that sported a buttery snap-like bounce. There was an appealing fishiness that was bright and upfront. One of the 2 "extra" items in the Premium Omakase was the Blue Fin Tuna. This was worth the money in my opinion as it was soft and melted-in-my-mouth with a sweet taste of the sea. Onto the next 3, it featured the second of the "extra" items in the Uni from Hokkaido. 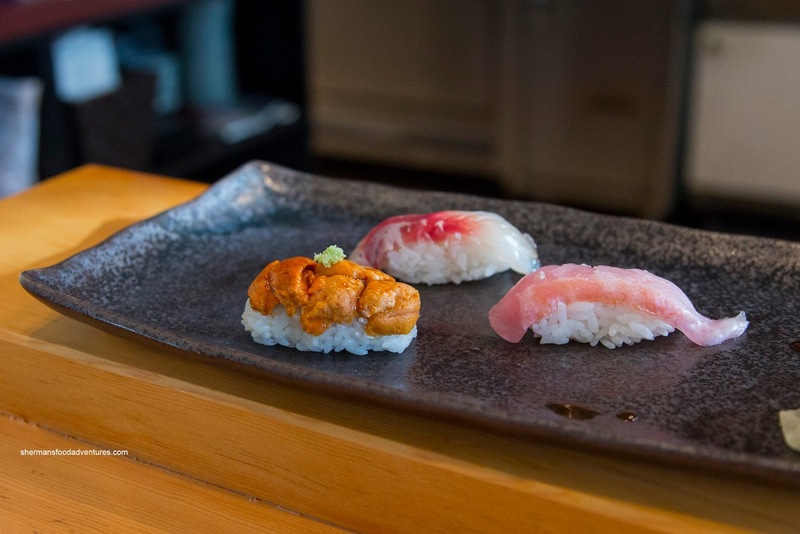 I personally love uni and sometimes the stuff we get here in Vancouver can be rather flavourless. Not this one as it was luscious and clean-tasting. To the left of the uni was the Kinmedai or Splendid Alfonsino. It was soft with a slight resistance while bright and mildly fishy (in a good way). In the back was the Grey Mullet which was firm and chewy. It was more flavourful in a sweet fishy manner than the rest. 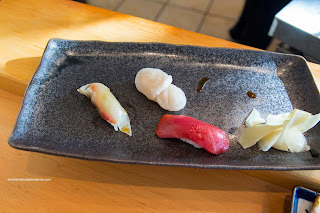 The last set of nigiri consisted of Aji, Kanpachi and Sea Eel. With a buttery light snap, the aji was super sweet complimented by the sharpness of the usual condiment of ginger and green onion. Commonly known as Amberjack, the kanpachi sported a light chewiness with a briny clean finish. Lastly, the eel was soft with just enough sauce that didn't inhibit the brininess. There was abit of background smokiness. As for the sushi rice, we felt it was on point with a balanced texture being chewy while still moist. It was fairly mild tasting allowing the fish to be the featured flavour. 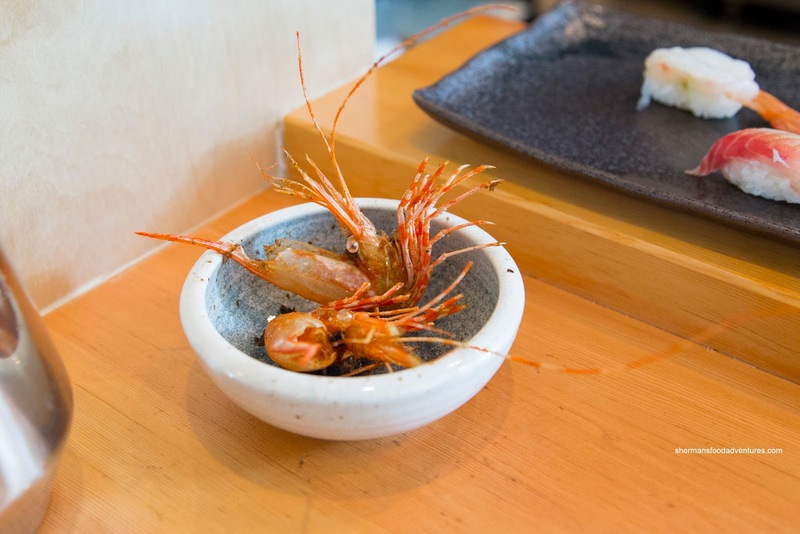 Of course when we have spot prawn, we also have Fried Shrimp Heads. These were done right being crunchy and completely edible without chewy portions. They were lightly seasoned as well. To complete our meal, we also got a Kashira Shioyaki Madai. This was grilled nicely with crispy skin and meat that was not overdone. It was also lightly seasoned. In the end, the entire bill came to $140.00 before tip. Expensive? Fairly, but the place is not for the value-conscious nor those wanting sushi rolls with enough sauce for a BBQ dinner. 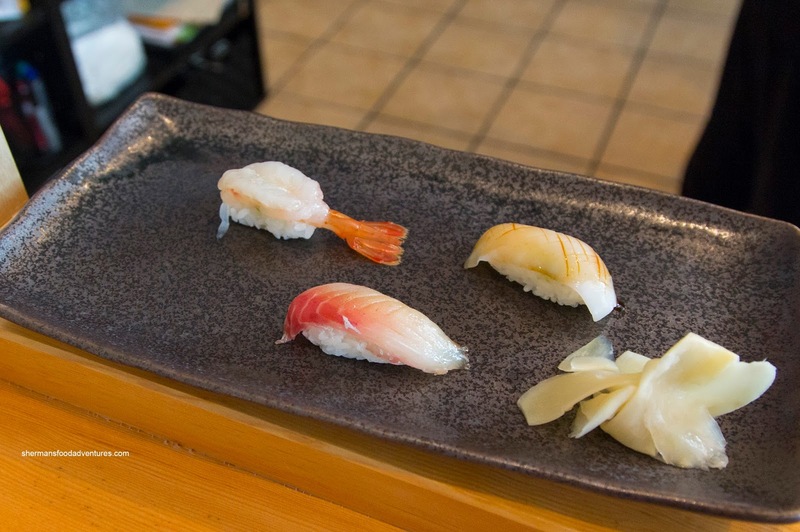 Come here for simple, no nonsense and well-made nigiri. Worth every penny IMO. Was the chef okay with you taking photos? @Areta Yup, he was okay with it. Just don't take pictures of him!